Falling into winter is an emotional time. Some even shudder when “the holidays” are mentioned early in the summer, and then when they actually arrive the third Thursday in November, we find ourselves feeling all kinds of crazy emotions, and wandering around breathing heavily like lost, little badgers. You may think that the holiday season begins at Halloween with its pumpkins appearing anywhere and everywhere like precocious fairies, but no. Halloween allows for the ultimate escape of one’s identity—and sometimes one’s senses—all with glorious makeup, flowing cocktails, and endless spun sugar. But when we get to Thanksgiving, well…that’s a different story. Thanksgiving puts who we are, and how we relate to one another, directly in full view; and this “viewing” continues as we pass through the Emotional Holiday Triad—Thanksgiving, Christmas or Chanukah, and finally New Year’s Eve. Nevertheless, fortunately or unfortunately, as each holiday arrives, we are flung into a vulnerable state—a state of feeling something, trying not to feel something, or wishing we could feel something. Our deepest desires for comfort are conjured into being, and there is no ridding ourselves of them. This is why I fill the seasonal “Triad” with pie. 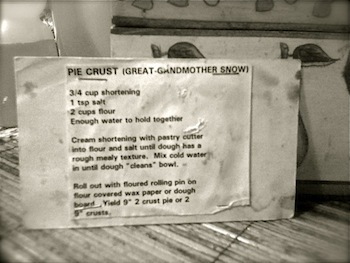 In my recipe box, I hold a remedy&#8212a very stained and dry 3×5 card with the typed words “PIE CRUST (GREAT GRANDMOTHER SNOW)” stapled to it. It was my grandmother who typed it out and passed it to me so many years ago, and I dutifully created the stains as one year folded into the next. That card holds four generations of women in my family. No matter the miles or years between us, I hear their voices telling me how to do each step. They also tell me years of doing something over and over can actually mean something, and that at least in the kitchen—with a little butter, flour and salt—I can take my mind off myself and my emotions, and share some food happiness with others. You may wonder, though, why you should even bother trying to make your own pie crust—particularly if you can find ready-made pie crusts out there that aren’t too horrible. Why not just take all the comfort in making the overall pie? Why create additional steps?? To that I say, “Sure. Why not?” Any time in the kitchen is always as special as you allow it to be. It’s also okay to keep a ready-made crust in the freezer while you’re learning, just in case it all goes to hell in a hand-basket, and you would just like to eat pie… now… please. But it’s my opinion that without trying, you may miss out on a special blessing. And once you’ve mastered it, and pass it on to someone else, you’ll receive a blessing even greater than the first. Take this for thought. The world we live in is full of fickleness. Pink slips fly faster than theinter. Youth and speed are worshipped above knowledge and experience—even though there is a need and room for both. We pinch pennies and stay on at work, instead of taking days off, either out of need for funds, or fear of losing them. Maybe it would do us some good to actually make something with our hands—experience an accomplishment. Humans need to feel comforted AND useful. So with this said, it’s my Galavant Girl hope that you find comfort in the kitchen this season. We all need it, no matter if we are feeling something, trying not to feel something, or wishing we could feel something. I know where I’ll be. I’ll be in my kitchen with my butter, flour, and my beloved Great Grandmother Snow’s Pie Crust recipe. —Elise McMullen-Ciotti a.k.a. The Galavant Girl. 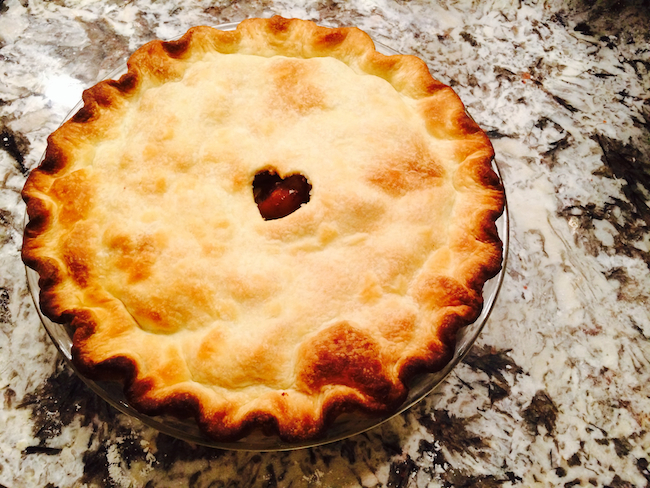 Over the years, I challenged these methods of pie making, and more particularly I challenged all the rules of making a pie crust. I tested them, doubted their whys, and pulled all the why-nots. I reveled in adolescent abandon and experimentation. I am a free spirit and an artist to the core, yet in the end I accepted that pie crust success doesn’t allow for bent rules. I have no regrets, however, in my revelry—even if I failed miserably at my baking from time to time. Here are the rules to follow, even though I have a suspicion that your journey will be similar to mine. As we all grow in a craft, we test the teacher and ourselves. It’s just the journey we take. I almost would rather you take some time to fail miserably in the kitchen with pie crust as you experiment in your culinary lab. Then you could see first hand what I’m about to share with you. But I also understand that you may have already had your dough-flinging, cursing spats in the kitchen with your pie crusts, and now you just need a solution, gosh darn it! And now! Cut butter into cubes. Combine the butter with a pastry cutter into your flour and salt mixture until it has a rough mealy texture. Mix one tablespoon of ice water at a time into your dough with a spoon until it “cleans” the bowl. Roll out dough with a floured rolling pin onto a floured surface. You may choose to roll it out between two pieces of waxed paper, but this is not necessary if you’ve kept your butter and dough cool, and if you are using just enough flour for the dough to roll out easily. The main rule&#8212the one that everyone wants to break&#8212is that you should not touch the mixture with your hands until the moment is right. When is that moment? Read on. 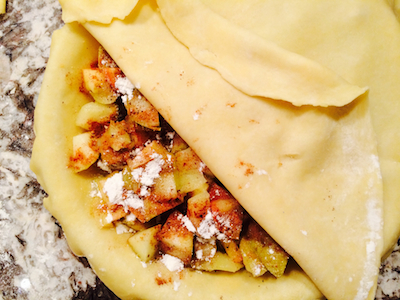 First, blend all of your ingredients (flour, salt, butter) with the pastry cutter until it looks like meal. DO NOT use your hands, and DO NOT add the ice water until the flour, salt, and butter, are properly combined. You also must add the ice water to the mixture a tablespoon at a time, and use a spoon to stir and mix it together. Only add enough ice water until the dough cleans the side of the bowl while mixing, BUT it’s imperative that the mixture still looks dry. If the dough is too wet it will stick to the counter and then you will have to add more flour to roll it. When you add more flour, the butter-flour ratio becomes off, and this will create a crust that is too dense—and therefore a royal pain to roll out. Now, once you have the mixture in this “cleaning the sides of the bowl” state, it should look roughly like something that could be made into a ball easily. You have finally arrived at the moment where you may touch the dough. So why did we wait? Until this point, the reason you have been told to not touch the dough, is because the heat in your hands will heat the butter to melting. When this happen the flour molecules absorb too much of the oil in the butter, and either the crust will crumble, or it will have zero flakiness. Polaroid capturing a moment—and the space between the butter and flour will create pockets of air, which we experience as a flaky crust. Do not overly douse your work surface, or overly knead the dough. Too much flour while kneading will upset the butter/flour ratio and breeds bricks not pie crusts. And when you knead it, count to 10. That’s it. No more, no less—just enough to make it into one mass. If you knead it too long, it will become gummy, elastic, and tough—springing back on you over and over. If you ever do get it rolled out, and actually bake it, the crust will be as hard as a rock when you cut into your pie. Please feel free to add comments and ask questions!